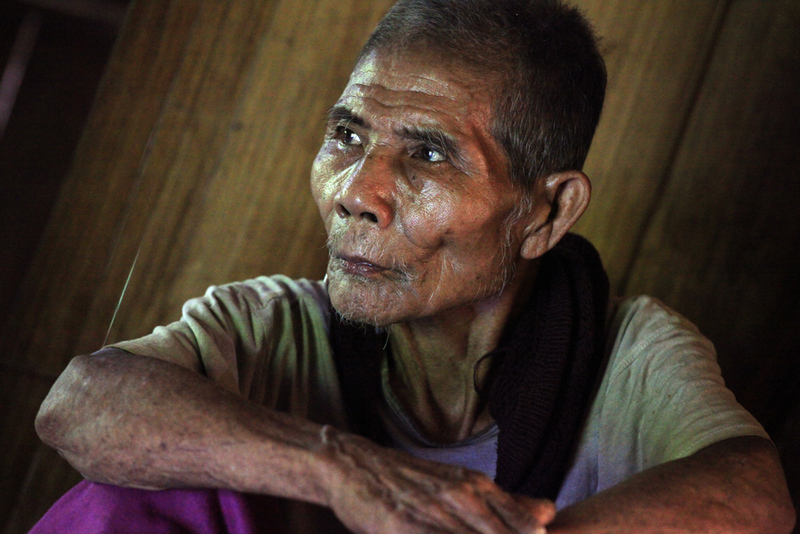 Telly, a member of the Karen ethnic group, mulled over the question of when he had last lived in a village, but failed to remember. He had lived in “hiding places” since 1975. The Karen state in eastern Burma has been the scene of intense fighting as the Burmese military has sought to crush the Karen Nation Union (KNU), a pro-democracy organisation representing the Karen people, and its armed wing, the Karen National Liberation Army (KNLA). 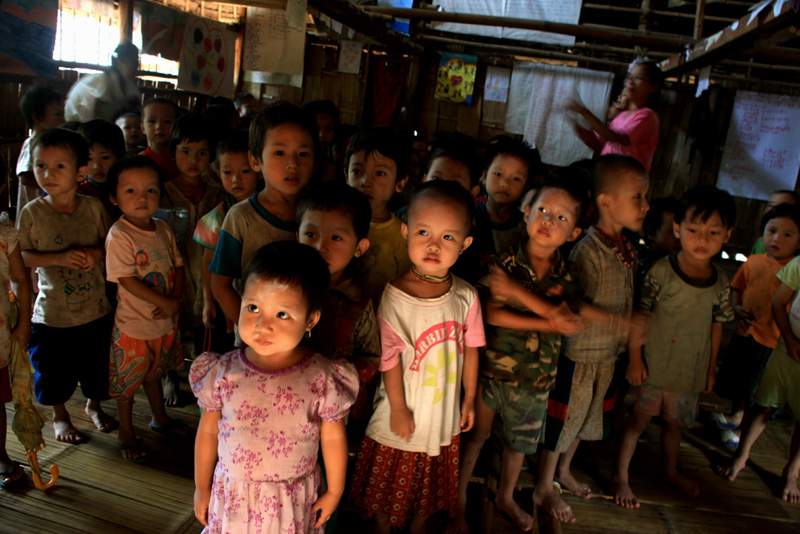 In decades of fighting, hundreds of thousands of Karen people have been displaced. “Here” is the Ei Tu Hta Internally Displaced Persons’ (IDP) camp. The camp is along the Salween River on the border with northern Thailand. The camp is said to be surrounded by two Burmese Army camps, which are two hours away on foot. Boats to Ei Tu Hta camp depart from Mae Sam Leap, the small, quiet town along the Salween River in northern Thailand. There are three Thai army checkpoints on Thai side and one “invisible” Burma army post on the Burmese side positioned on the route. The area of Ei Tu Hta used to be a battalion post of the KNLA, but now it accommodates some 4000 IDPs. They were all displaced by the Burmese military’s all-out offensive in eastern Burma, which lasted from November 2005 until 2007. Mar Su’s village has been burned down four times by the Burmese army, who forcibly displaced people to Turmidoe village, six hours away by foot. The Burmese military routinely burns down villages as a means to relocate people, often seeking to alienate villagers from the armed insurgents. But, unusually, this time the army didn’t retreat from the village after burning it. A further 30-minute boat trip from Ei Tu Hta to the north takes you to another camp site in Ueclo, where about 480 IDPs have been sheltering since July 2007. Like other refugee camps, Ueclo used to be deep forest, where people established temporary shelter and tried to farm as much as they could. However, Ueclo is not good for farming because of the rocks surrounding the area. People complain they cannot cultivate vegetables either. 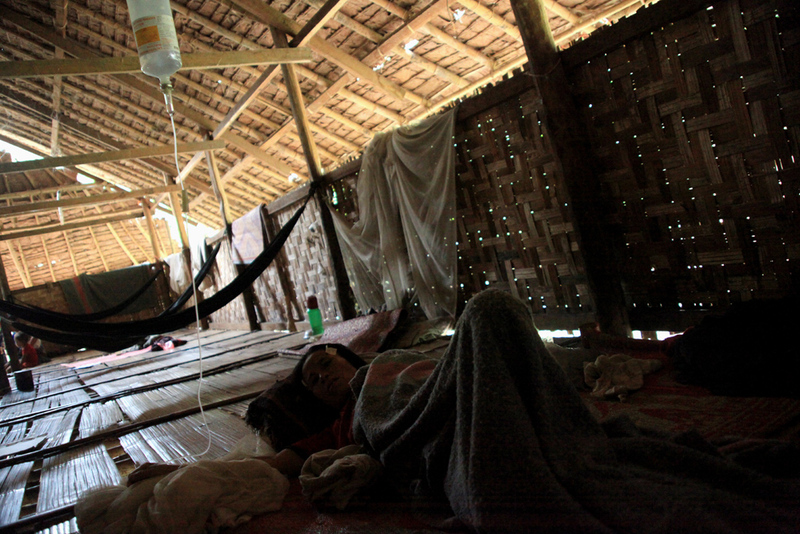 Nancy fled to Ei Tu Hta with her ailing husband, whom she had to carry on her back for 12 days through the jungle. “I feel rather safe in Ei Tu Hta, for the first time in decades, during which I’ve had to move numerous times”, she said. Yet “safe” is not a sustainable word in this jungle world. The Burma Army and the pro-Junta Democratic Karen Buddhist Army (DKBA) jointly assaulted the southern part of Karen state in June, and a military operation has been predicted for Ei Tu Hta after the rainy season. The offensive in southern Karen state occurred in the rainy season, an unprecedented event. Yet it was a success for the Junta and DKBA, as the area fell to them after a three-week-long fierce battle with the KNLA. As a result, about 4000 IDPs in Ler Per Her camp in southern Karen state have been displaced to the Tha Song Yang refugee camp on the Thai side of the border. Remnants of the KNLA have been ambushing the DKBA, which now controls the area. N0 one doubts this was the greatest loss for KNU since the fall of Manerflaw in 1995, where it used to have its headquarters. However, Ei Tu Hta is different. DKBA forces had been stationed in southern Karen state before the June operation. However, Ei Tu Hta is “heavily guarded by our forces”, 59-year-old Colonel Saw Kyaw Moo said. A KNU leader, who didn’t want to be named, endorsed this view, based on the agreements signed by the Thai army and Burmese army as well as the KNU. As part of these agreements, the leader said, the Thai army has strongly demanded the two hostile forces, the KNLA and Burma army, “not make noisy by shooting” around Mae Sam Leap. This is due to the number of tourists each year that enjoy the Salween River when rainy season is over, generating lots of income for Thailand. The leader also hinted that there are KNLA “special sniper groups” active in the area. Inside the Ei Tu Hta camp itself, an intelligence network is on the alert. Jungle agents report back to those in the camp about the movement of government and DKBA forces. KNLA cadres, often along with cadres of the All Burma Students Democratic Front (ABSDF — an armed group that emerged from the 1988 pro-democracy uprising) patrol the area. In Papun district, which includes Ei Tu Hta, there is also the ABSDF “frontline”. If the rumoured offensive occurred and spilled into the district, the poorly armed ABSDF may have to engage in the fighting. Although the ABSDF has welcomed dozens of new cadres in recent times, who enrolled in the armed struggle after the monk-led “saffron revolution” in 2007, the group is poorly equipped with just a handful of AK 47 assault rifles and M16s given to them by the KNLA long ago. It has also been suffering hunger without significant external support. The armed struggle has been marginalised partly due to the fact that non-government organisations (NGOs) with a “non-violence” principle have been flourishing in Burma’s exiled movements, particularly since September 11, 2001. Because the area is one of the crucial gateways from Burma via jungle to northern Thailand, its fall could have a fatal impact on Burma’s exiled movements in Northern Thailand. 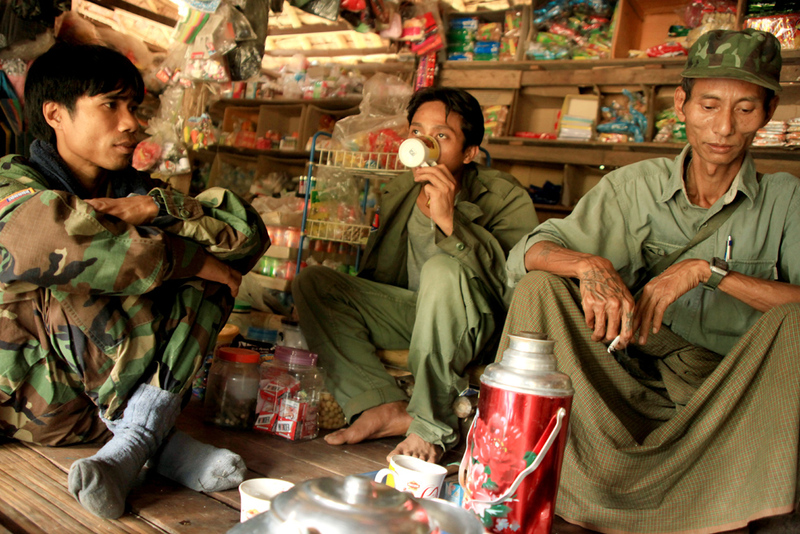 The Burmese junta and its proxy forces would find it far easier to infiltrate those movements. The junta seems to have this as its dream before its ambitious 2010 elections. “The junta has an ambition to eliminate all the obstacles to consolidate its power before the 2010 election”, said the ABSDF chairperson, Than Khe, who is currently based in Thailand. The junta’s deadline for dozens of ethnic groups that have agreed to ceasefires to transform all armed groups into Border Guard Forces is also understood in this regard. It has much to do with the new constitution and the upcoming elections, as the junta is seeking “unitary command” above “all armed forces”. This goal is set out in the new constitution, authorised by the so-called referendum when the country was hit by Cyclone Nargis in May 2008. Saw Ya Tu, the 54-year-old chief of Ei Tu Hta camp, spoke about the escape plan for the IDPs in the event of a military offensive. It is a huge operation as there are nearly 5000 IDPs in both camp sites. Nevertheless, the chief has a more pressing problem. There is a shortage of food for IDPs in the camp, as well as throughout eastern Burma, where 450,000 IDPs are estimated to live, with more than 100,000 IDPs in Karen state alone. The Ei Tu Hta camp gets rice and salt from the Thai Burma Border Consorsium, which also provides for refugees on the Thai side. Some Christian NGOs have supported schools in Ei Tu Hta camp. However, IDPs inside Burma have received far less than refugees on the Thai side, despite the fact that the number of refugees on the Thai side is estimated to be one-third of the number of IDPs inside Burma. The recently released report by the Karen Human Rights Group Starving Them Out has vividly drawn out this miserable situation for IDPs inside Burma. The report said that, owing to increasing military activity in the government-controlled areas, villagers some parts of the Papun District are in danger of starving. These villagers do not expect to survive for more than a few months on this years rice crop. By the end of October, the predicted offensive by the Burma Army and DKBA had not yet taken place. A report about ceasefire talks between the DKBA and KNU emerged on October 19. But the talks failed, creating more uncertainty for those hiding and the starving population in the jungle.